WANT TO LEARN WHAT IT TAKES TO RUN YOUR OWN FOOD SERVICE BUSINESS? 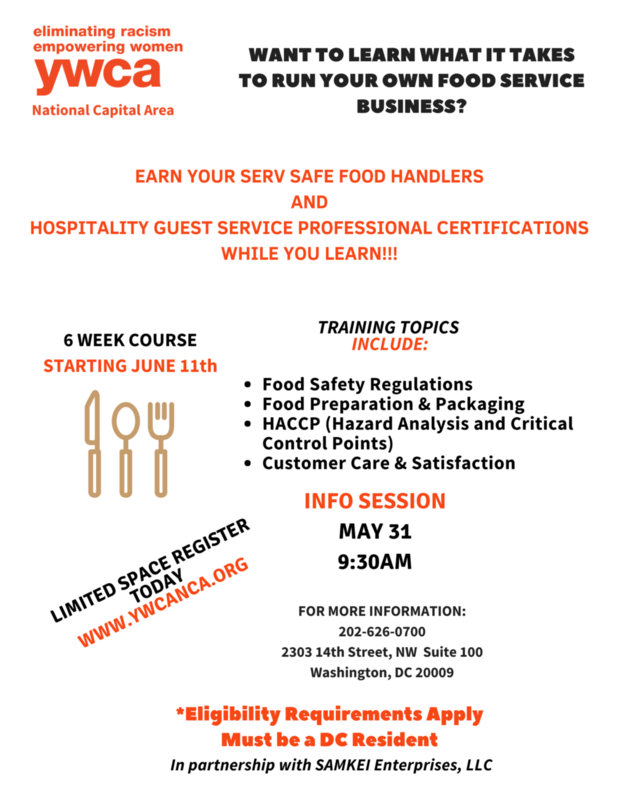 YWCA National Capital Area and SAMKEI Enterprises, LLC present a special course on careers in the food service industry. The six-week course begins on Thursday, June 11. This opportunity will give learners an inside look at what it takes to run a food service business. In addition, this course will prepare learners to earn the Serv Safe Food Handlers and Hospitality Guest Services Professional certifications. Some eligibility requirements apply. Must be a DC Resident. For more information, call YWCA National Capital Area at (202) 626-0700. Don’t delay – space is limited! Complete this registration form to start enrollment online.